At WorkWhileWalking, we’re often asked how treadmill desks and desk cycles compare. Our answer is no secret: we think walking is the best way to stay active at work. That being said, we also recognize the surging popularity of cycling at your desk, and we want you — as a worker committed to office fitness — to be as informed as possible on the merits of these relatively new products. We sent our staff out to review the top under-desk pedal units on the market. They investigated design features, weight and size specs, customer experiences, and more according to our rigorous review process. Below, you’ll see the combined results of our research. You can click on the product name to read the full review, or the button “Add to Comparison Table” (then ‘Go’ in the bottom right) to see different products’ features side by side. Note: under-desk pedals are different from bike desks. Bike desks are upright stationary bikes with an integrated desk platform, and include such products as the FitDesk 2.0 Bike Desk and Lifespan C3-DT3 bike desk. To learn more about these and other bicycle desk units see our round-up of Bike Desk Reviews. Of these, the Cubii qualifies as a true, state-of-the-art office fitness product, replete with Bluetooth link to a smartphone app and integration with popular wearable devices like FitBit. But before buying one of these devices, we strongly recommend our primer, How to Set up an Ergonomically Proper Desk Cycle. With the possible exception of very short individuals, most users find that the key to a good setup is combining a pedal exerciser with an adjustable-height desk, and ideally an articulating ergonomic keyboard tray. The field for desk pedals runs the gamut in price—from $25 to $1000s—with good units generally $200 to $350. 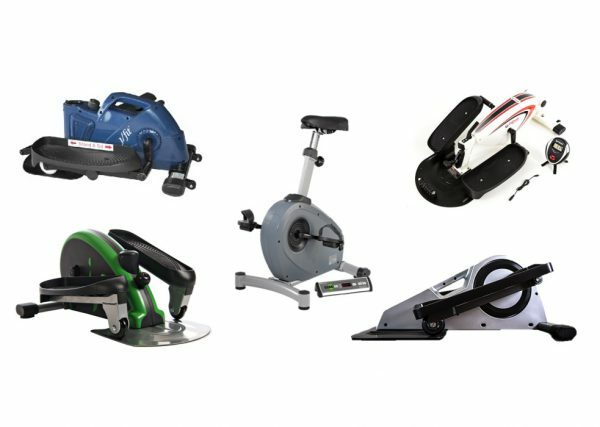 We’ve split our reviews for pedal exercisers into the three types listed above, Under Desk Ellipticals, Desk Cycles, and Bike Desks. See abstracts from our reviews for each product below. Click a title to be taken to the full review page. Pros: High-tech office fitness product that stands out as the only one that connects to your smartphone through Bluetooth and integrates with popular wearable devices such as FitBit. Within the category of under desk ellipticals, nothing beats the Cubii. All the other products are basic mechanical devices sold through infomercials and mass merchants and aren’t designed to last. Cons: All under desk pedal units require switching to a height-adjustable desk, especially for people with longer legs. If you work at a fixed-height desk, you may need to upgrade to a sit-stand desk to avoid banging up your knee caps. Cubii is at least twice the price of popular competitors that don’t have the wifi connection, phone app, and cool looks. All under-desk ellipticals pose some ergonomic stresses on the lower spine, neck and shoulders; Cubii is not immune to these issues, which affect all products in this category. If you’re susceptible to low back pain or posture-related issues we recommend sticking with a standing desk or walking desk. Bottom Line: If you’re looking at under desks pedals, ellipticals are definitely the most ergonomic and fit under a desk much better than under desk cycles with their circular strokes. As under desk ellipticals go, this is the Cadillac model. And it’s the only “smart” unit with a Bluetooth link to your smartphone app and integration with devices like FitBit. Pros: Low pedal height rotation (though, not as the company claims, the lowest in the market). Uses a fluid shuffle motion found in larger elliptical machines. Built-in handle and wheels for easy transport. Includes a wheel lock to keep your caster-base office chair from rolling back as you pedal. Resistance level is changed with a foot lever. Has a built-in foot massage bar. Cons: The unit is long; to function properly it will stick out from behind the desk. Despite the built-in handle and wheels, it is bulky and cumbersome. Users report squeakiness during pedaling and sometimes knocking sounds. Manufacturer recommends using Pledge as a lubricant. Bottom Line: Boost the price, boost the quality. Durability on this machine is excellent compared to the Stamina products. And it’s designed specifically for use while sitting. It boasts one of the lowest pedal height rotations in the market, so you’re less likely to hit your knees on the bottom of your desk. The downside is the length. Only recommended if your desk space has room for it. Pros: Offers two angles for pedaling while sitting (which allows users to switch up the muscles groups targeted and find the optimal under desk pedaling motion). Includes a convenient handle and rollers for easy transport. Manufacturer claims the skateboard wheels create a smoother glide. Cons: Squeaking noises are common—needs regular lubrication. Taller users have difficulty with the short stride. Customers complain of its bulkiness (but it is not much heavier or broader than average for this product category). We don’t recommend the standing-while-pedaling feature while working at a desk. Bottom Line: With two pedaling angles in the sitting mode, the j/fit gives you a better chance to find a stride that fits under your desk without your knees hitting the bottom. It also comes with a handle and rollers for easy transport and a monitor to track exercise stats. But it’s not as well-tested in the marketplace as competitor products, and we have some concerns as to its durability—especially if the standing mode is frequently utilized. Cons: Like its sister product, the Stamina InMotion Compact Strider, there are serious durability concerns based on user reviews. Consistent reports of squeaking noises after a couple months’ use. Pedaling becomes less fluid over time. A design flaw has led to the left pedal falling off. The unit is unstable overall when used while standing (which is already near impossible if you’re trying to type and pedal at the same time). Its short stride is more like stair climbing. Bottom Line: Serious durability problems make this a product to avoid. Happy Amazon customers abound, but few subject the unit to sustained use. Count yourself lucky if the left pedal doesn’t fall off in less than a year. It’s worth paying for a more dependable unit. Pros: Very inexpensive, and has a built-in handle for easy transport. Cons: Like its sister product, the Stamina InMotion Elliptical Trainer, there are serious durability concerns. Consistent user reviews report squeaking noises after a couple months’ use. Pedaling becomes less fluid over time. A design flaw has led to the left pedal falling off. Unstable overall when used while standing, which is already near impossible if you’re trying to type and pedal at the same time. The unit’s short stride is more like stair climbing. Bottom Line: The only difference in manufacturing between this model and its sister product, the Stamina InMotion Elliptical, is cosmetics. A handle on top helps with portability, but the same fundamental design issues persist. 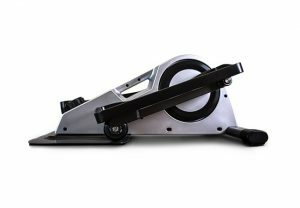 If you’re looking for a durable, long-lasting desk pedal exerciser, there are others on the market. Pros: Has LCD display with calories, time, speed, distance, etc. You can work both your hands and feet with this device. Uses a magnet for resistance and has a sturdy steel frame. Can be used standing or sitting, and has a top handle for easier transport. Cons: Pedal stroke is too high for use with a standard desk – requires an adjustable-height desk. Has issues sliding on the floor. Some complaints about a clacking noise. Bottom Line: A sturdy steel frame makes this a quality piece of equipment. Add a plethora of positive user reviews and you have a real contender. But there’s problems using it under your desk. For one, the circular pedal motion raises your knees higher. Plus, the unit is 14″ tall, a couple inches taller than average. You could have trouble fitting it under your adjustable height desk without compromising your ergonomic posture. We recommend an elliptical unit. Pros: Magnetic resistance for a smooth, quiet pedal motion. Bidirectional with a high range of resistance (3x the competition). Comes with an electronic display for distance, time, calories, and speed. 1-year full warranty. Cons: Geared more towards use in physical therapy clinics than the office. A higher pedal height (5 inches taller than the DeskCycle) makes it tough to use at a desk. A few users make minor complaints about the unit sliding or rocking. Bottom Line: This device isn’t designed for use with a desk. True, it’s a hit in physical therapy clinics and adult homes, but the manufacturer recommends another model, the DeskCycle, for under desk use. We’d recommend another too. Pros: Sleek, low profile for use under a desk. Takes up little space in your office. Quiet pedaling mechanism means you’re not going to bother your co-workers. Different resistance levels allow you to customize your desk pedaling routine. Cons: Requires a height-adjustable desk and ergonomic peripherals. It doesn’t prevent back stiffness from sitting in a chair. Bottom Line: Since our first review of the DeskCycle back in 2014, new desk cycles have entered the market, including under desk ellipticals. The DeskCycle holds its own in that its smooth, quiet ride won’t bother your coworkers. However, its cycle motion does make it difficult for tall users who hit their knees on the bottom of their desk, and ergonomically, it’s tougher on the knees. We recommend going with an elliptical unit. Pros: Extremely inexpensive. Lightweight (6.2 lbs) and portable (folds up). Variable resistance settings. Comes with a timer. Cons: Jerky motion due to lack of a flywheel. Squeaks with high tension. Friction based, so it generates a lot of heat. Cheap feel in general, especially the foot straps. No console for speed, distance, etc. Unit may slip away, especially at higher tension, requiring something to stabilize it. Bottom Line: Here you have it—the bottom of the line budget cycle desk. Cheap as it gets price wise, cheap as it gets in all ways, really. 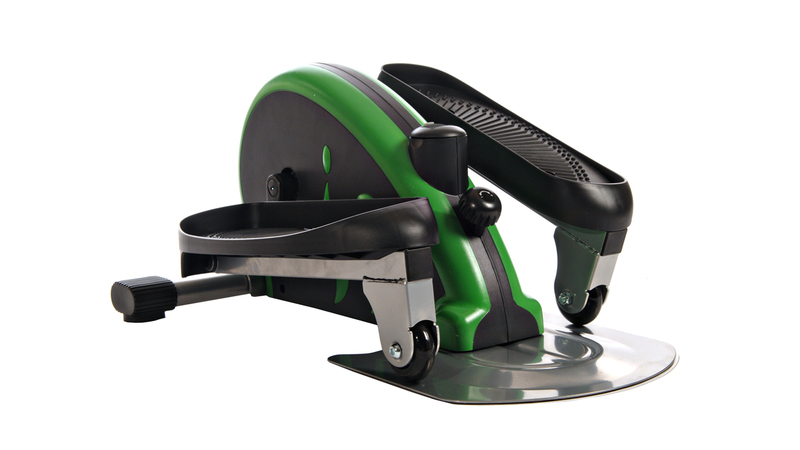 The Stamina InStride Folding Cycle does come with a 90-day warranty and the convenience of folding up. But predictably, it has quality concern issues. The motion is jerky due to lack of a flywheel, it squeaks with higher tension, and the friction generates a lot of heat. You’ll likely be folding this one up for good after a little use. If you’d like more insight into how we reviewed the desk cycle category, check out our guide “How We Found the Best Desk Cycle“. It will walk you through the top criteria we used in coming to our pedal exerciser recommendations. To learn about the related category of stationary bike desks, check out our round-up of Bike Desk Reviews. Thank you for bringing this one to our attention. 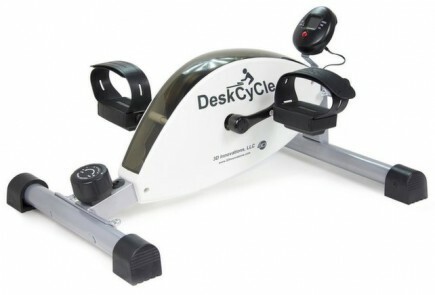 We’ve added it to our list for the next update to our desk cycle review round-up. I have a cubii and I’m struggling with using it because I can’t find the right chair. Typical office chairs roll away while using it and don’t work. I tried a folding chair, but it was a weird height for typing at a desk. Do you have any recommendations for something stationary or lockable, adjustable or good desk height, and ergonomic for sitting in for long periods? Why is this? could you provide a source? I have to work sitting on a desk most of the day. As a graphic designer a treadmill desk is not a good solution since I need to do very fine mouse movements or pen tablet movements when I have to draw. Walking at the same time is not too good for that. I go to gym and have short movement breaks now and then but that does not fully counter the drawbacks of sitting all day health-wise so I’ve been thinking on getting a Cubii. But if the above statement is true, then I’m not too sure it is worth it since I may trade and issue for another one. I don’t particularly suffer from lower back pain but I want to avoid it if I get it by using it. So what would you recommend? Thanks in advance! Hi Edu, thanks for your comment! All under-desk pedal units will place some strain against your lower back because the force required to pedal pushes you back into your seat. (That’s why many models come with caps for securing your office chair wheels…so any movement backwards is thwarted.) However, our experience using desk cycles or under desk ellipticals has not caused us any pain or created any posture issues. We know they cause pressure, but it’s not enough to bother an otherwise healthy user, especially if you’re only doing the pedaling for an hour or two a day. Our concern is more for people already struggling with back pain or posture-related issues, and the possibility of aggravating old injuries. You should be in the clear. Cubii is a great choice. Are under desk elliptical machines weight bearing if you are sitting & not standing up as in an upright model with handle bars? Thank you for addressing this concern as I have some osteoporosis & weight bearing exercises are the type of exercise I should be doing.